Visiting Hue Vietnam, you’ll likely have a great impression about an ancient and charming city. Hue brings a dreamy scene of elegance, tranquility, and from another perspective, a whiff of romantic sadness. To us Vietnamese, when mentioning Hue, we think of grace of Hue girls in traditional costume Ao dai, with the distinguished color called “tím Huế” (Hue violet). Hue is the old and the last feudal capital of Vietnam. Since Nguyen dynasty ceased to exist in 1945, Vietnam’s capital has been moved to Hanoi. Regretfully, many of those constructions suffered considerably in war combats in 1885, 1947, and 1968. The buildings have been restored with big effort from Vietnamese government. 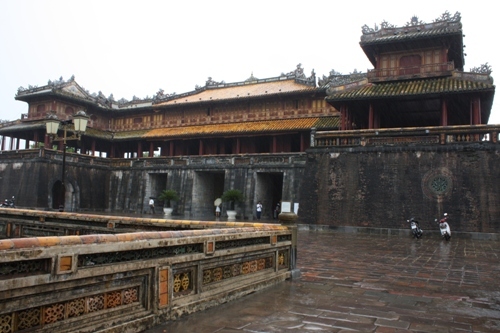 Since 1993, UNESCO recognized Hue Vietnam as a World Heritage Center. Located in the central of Vietnam, Hue has tropical climate with two seasons. Over half time in a year is rainy season, with average temperature of about 20°C - 22°C (68°F - 72°F). Torrential rain begins from September to December, and reduces to continuous soft rain from January to March. In some years, it rains consecutively in many days in this season. So it’s obviously not ideal for tourism. You don’t want to stay in hotels all days waiting for rain stopping, don’t you? In fact, the best time to visit Hue is in the not-so-rainy season, which is from April to August. The temperature then averages 27°C - 29°C (81°C - 84°F), but the hottest days may reach 38°C- 40°C (100°F - 104°F) in May and June. If you’re planning for a trip to Hue Vietnam, you should update the current weather. Below is Hue weather forecast for your easy reference. From Hanoi or Hochiminh City, you can catch domestic flights to Hue. Phu Bai International Airport (Code: HUI) is located in the south, about 15 kilometers (9 miles) away from the city center. It was temporarily closed from March to September 2013 for repair. There’s another option, like in my case, you can fly to Danang airport, then go about 100 kilometers (62 miles) by bus or taxi to Hue. Besides, you can go by train or by bus directly from Hanoi or HCMC. Like other cities in Vietnam, you can go around the city by taxi, motorbike (xe ôm), cyclo (xích lô), or by bicycle. I prefer to hire a motorbike and ride it myself. It’s pretty fast, convenient, and can flexibly access to almost any places. Cơm hến (Mussel Rice) is very common for breakfast. It has a typical taste of Hue: very hot (chilly). If you can’t eat chilly, remember to remind sellers beforehand, or call an iced tea to make it less hot. Bún bò Huế (Hue Rice Vermicelli with Beef) is also a delicacy for breakfast and lunch. I love this food and can have double bowls for lunch. Sometimes, I have it in my city Haiphong. But I’m sure Bún bò Huế is much more delicious in its origin land: Hue Vietnam. Cơm chay (Vegetarian Rice) is a common name for all vegetarian foods, which are traditional and famous cuisine in Hue Vietnam. With many residents eating vegetarian food twice a month, Hue has a lot of veggie restaurants for your selection. Some of them are Tịnh Tâm (at No. 4 Chu Van An street), Liên Hoa (at No. 3 Le Quy Don), Bồ Đề (at No. 35/1 Ba Trieu), etc. Chè Huế (Hue Sweet Soups) is a very popular dessert, not only in Hue, but also in our nationwide. I’ve already eaten this food in many other cities like Hanoi, Haiphong, Ho Chi Minh City, and Da Nang. But the foods are particularly various and delicious in Hue Vietnam. A cup of it includes some of many types of ingredients such as lotus seeds, longyan, pomegranate, areca flower, beans, corn, and grapefruit. If you’re fond of coffee, take a chance to savor at several coffee shops with great view like Vĩ Dạ Xưa, and Lầu Tứ Phương Vô Sự. This place is a must-see when visiting Hue City, especially if you want to understand about Vietnamese history. Though constructions are in ruins, authorities are working hard to conserve the landmark. 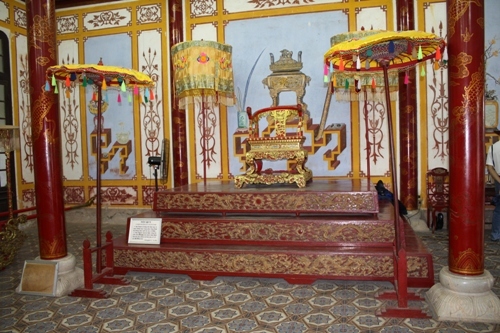 The tombs are the final resting places of the Nguyen kings. 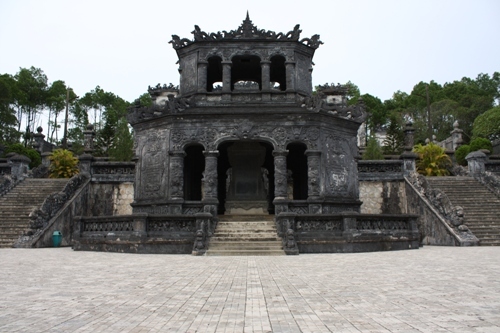 There’re 8 tombs, but the most popular to visitors are those for King Minh Mang, Tu Duc, Khai Dinh due to their glamorous architectural features. A quiet and peaceful pagoda surrounded with gardens. It’s overlooking the river with romantic view and free to visit. The landmark is not large, so you can take about 30 minutes to go around. It’s good idea to combine in city-tour or with dragon boat ride on the Perfume River. More about Thien Mu Pagoda. the Perfume River in conjunction with Ngu Binh Mountain makes the royal screen. At night, listening to songs on Perfume River is a distinguished charm of this former royal capital. Lang Co is a 10-kilometer stretch of white sand beach, behind which are the crystal-clear, blue Lap An Lagoon and a range of Bach Ma mountain. The area offers travelers with various resources including coast, sand-bank, lagoon, mountain, and national garden. So how do you think about Hue Vietnam? Do you think it’s attractive to visitors? Share some of your thoughts here. We’d love to hear from you! Also, if you find useful information in this article, would you mind encouraging me with a Like button? I love your thumbs up. Thank you!